Pick Analysis: Jones' father, Cal, named his son after his favorite football player, Deion Sanders. His nickname has been "Debo", as in Deion and Bo, like Jackson, put together. The New Orleans native is living up to the expectations, winning the Metro Defensive Player of the Year as a senior in high school and eventually starring for his home state LSU Tigers. Jones had to be patient, though, as his first three years in Baton Rouge resulted in exactly one start (due to an injury to Kwon Alexander). He played primarily on special teams in 2012 (23 tackles, three for loss) and 2013 (15 tackles) before seeing more time on defense as a junior (27 tackles, 3.5 for loss). Then came Jones’ chance to start with Alexander moving on to the NFL. He became permanent team captain and defensive MVP after leading the team with 100 tackles and 13.5 tackles for loss. He also had five sacks, two interceptions, and three pass breakups, showing scouts an all-around skill set giving him a shot to play at the next level. 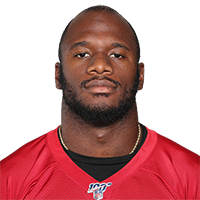 Published: March 15, 2016 at 08:40 p.m.
Watch Louisiana State University linebacker Deion Jones work out at the 2016 NFL Scouting Combine.